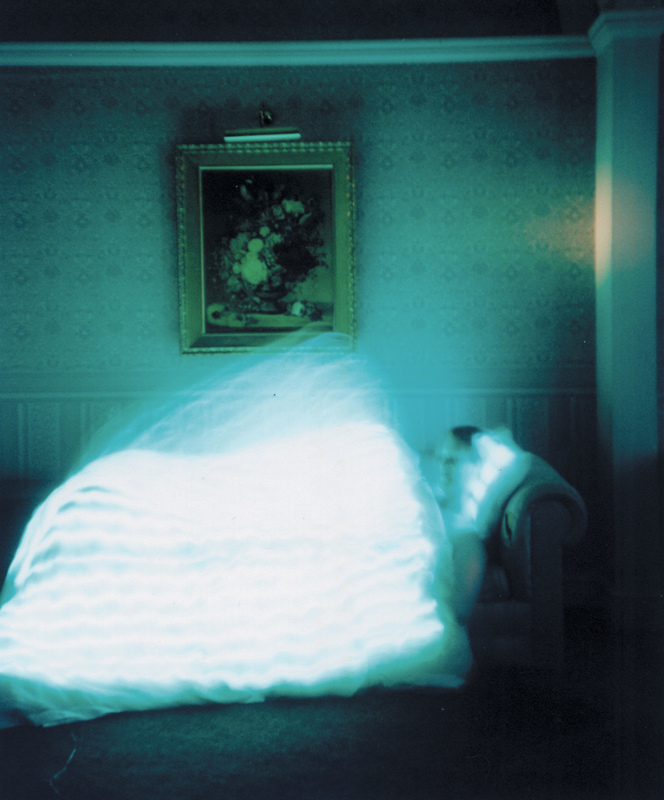 Light Sleeper was developed during Rachel Wingfield‘s study at the Royal College of Art in 2001 for mobile phone company Orange’s House of the Future. It was later commissioned by Danny Boyle to feature in his sci-fi adventure film Sunshine released in 2007. 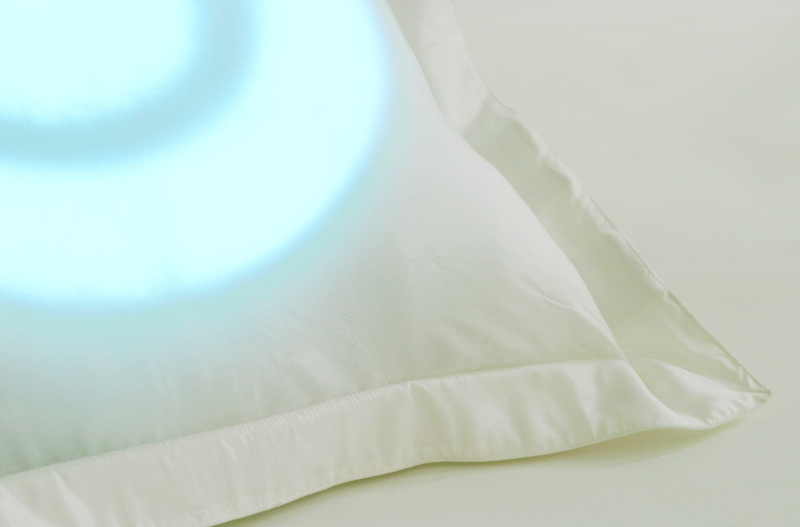 Light Sleeper is an illuminating, personalised alarm integrated into bedding that gently wakes in the most natural way. 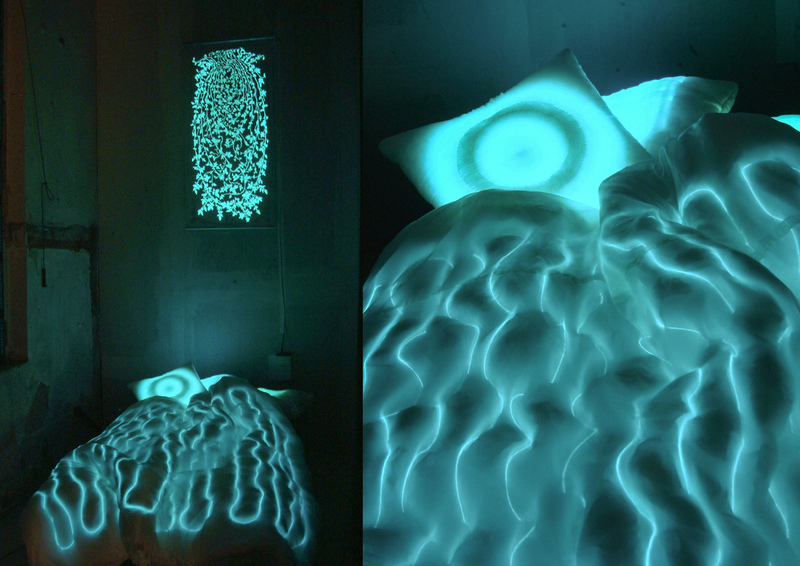 Ever since the beginning of time light has controlled our body clock telling us when to sleep and when to wake. As lifestyles are rapidly changing with increased travel and demands on our time, people’s natural body clocks are out of sync. 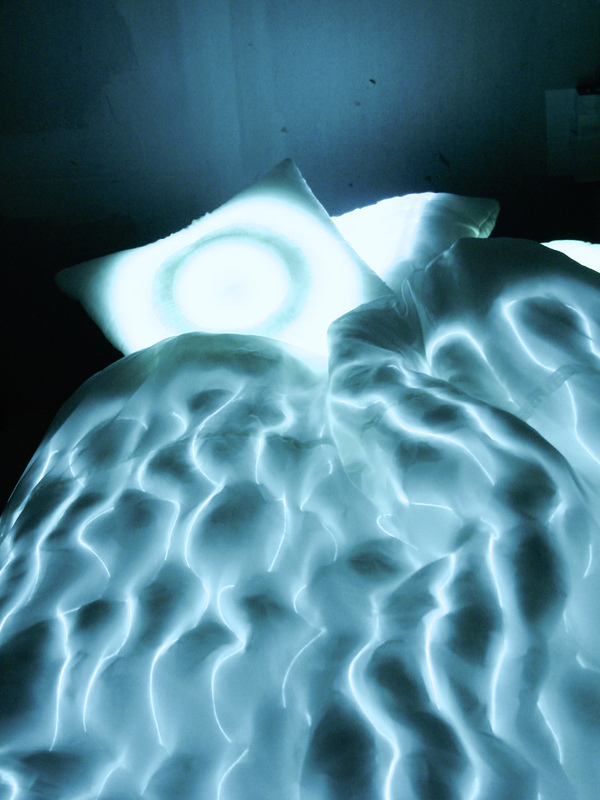 This pillow and duvet simulates a natural dawn that eases you into your day. 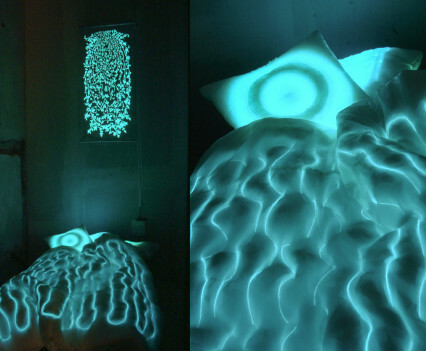 LightSleeper Bedding uses electroluminescent technology allowing traditional textile surfaces to become a reactive light source. 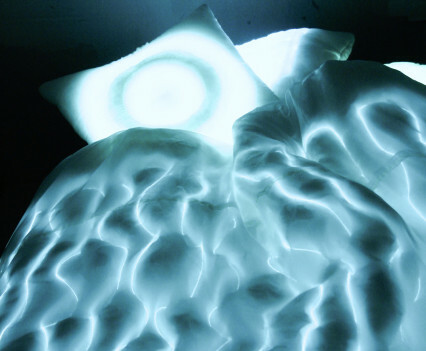 The bedding aims to treat sufferers of seasonal affective disorder (SAD) where insufficient levels of daylight cause medical conditions caused by a hormonal imbalance ranging from depression to loss of energy, pre-menstrual syndrome, weight gain and migraines. 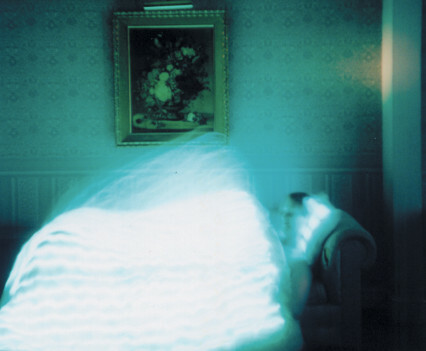 It is recognised by most scientists that SAD and other sleep/ mood disorders are linked to a shift in the suprachaismatic nucleus or circadian rhythm and often referred to as the ‘body clock’. 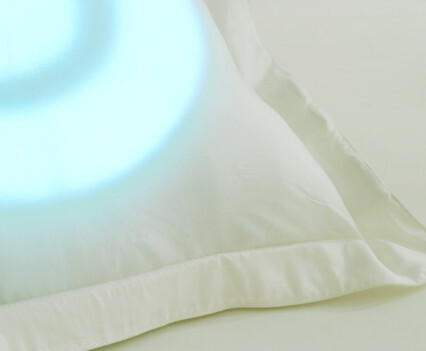 It is recommended that a bright light stimulus is needed to reset the body clock everyday recognising that this controls our daily sleep/ wake cycle and hormone functions. It uses signals from the sun and bright light to reset these functions, therefore in the winter months our bodies can receive these signals at the wrong time of day or not at all. 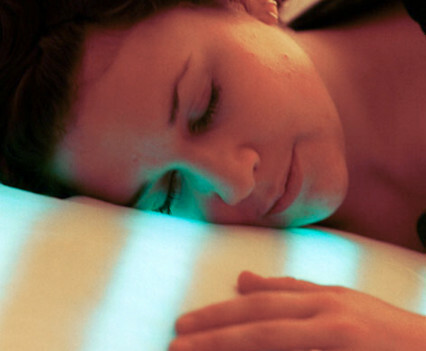 By using a bright light, 10,000 lux, our bodies reset and the right hormones are released ensuring we feel active and energetic throughout the day with the need to sleep at night. Exposure to intense artificial light suppresses the secretion of the night time hormone melatonin, and may enhance the effectiveness of serotonin and other neurotransmitters. It is believed to be the only way of shifting the circadian rhythm. Research shows that the body’s internal clock only responds to bright light at certain times of day. This peak time in normal people occurs when the circadian rhythm is in R.E.M sleep, which is approximately 1 to 2 hours before waking. 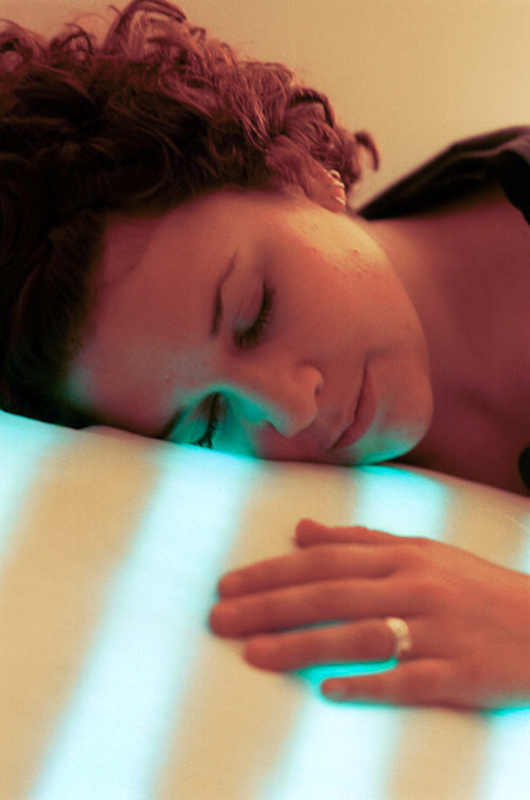 This promotes the use of Light Sleeper Bedding and proves it to be one of the most effective products for treating SAD and improving well being as it synchronises our body clock each morning. The bedding is also suitable for those who keep unusual hours and who travel in helping to prevent jet lag and regulate the body clock. Our body clock responds to an imitation sunrise by accelerating the wake-up processes. 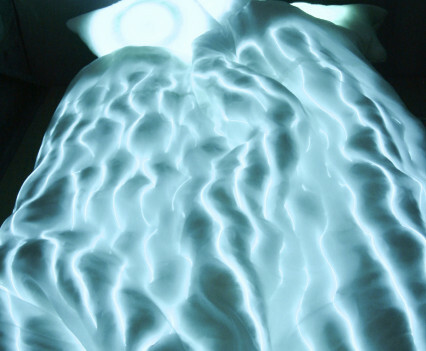 Research indicates that it is important that the light comes on gradually and that having a light on an on/off time switch will not have the same effect, this is why light sleeper bedding gradually begins to glow in a natural breathing rhythm over a 15-20 minute period. 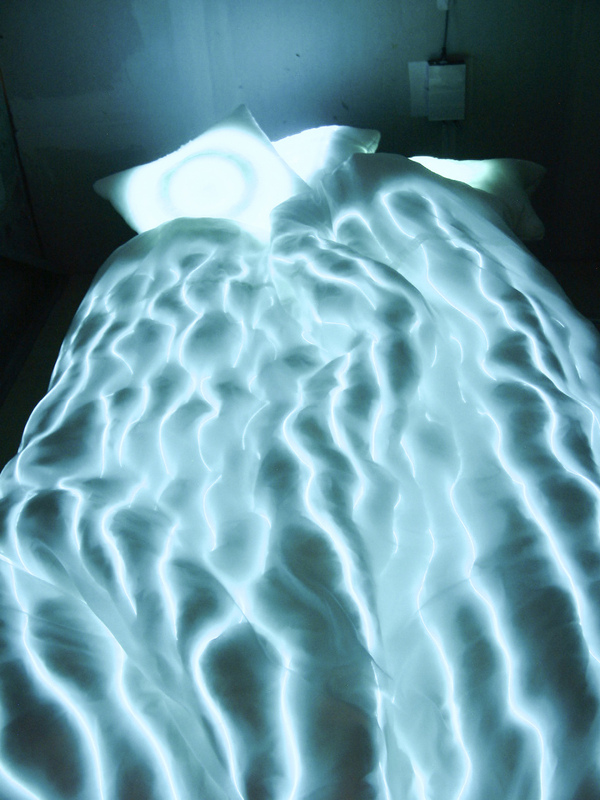 Share the post "Light Sleeper"